In Abraka Delta state Nigeria sits one of the best State owned center of knowledge in the country, a university bursting with life and academic activities which churn out world beaters year in year out. I’m talking of no other university but Delta state University Abraka. A university that is populated with over 37,000 students, DELSU as it is popularly known offers admission to some 3000 students every year. Established in 1992, the school has grown from strength to strength ever since. I wrote this article to help aspirants who might love to apply to school in DELSU with some of the vital information they would need so as to easily get admitted. For aspirants, DELSU usually conducts post-utme screening for qualified candidates who scored above 180 in Jamb and who also chose DELSU as university of first choice between June and September every year. Candidates are to note that DELSU post-utme registration cost just N3000 and it covers for post-utme result checking too, post-utme registration form is sold in designated bank around delta state. DELSU aspirants are advised to follow all necessary procedure during and after registering for the exam to avoid disqualification. Aspirants should visit www.delsuonline.com to generate an e-pin using their jamb registration number before taking the pin to a bank for payment. Candidates should also take care so as not to input the wrong Jamb registration number or input a local government of origin different from what was submitted during jamb registration, such error would lead to disqualification. Candidates are also advised observe examination etiquette during and after their post-utme exams. 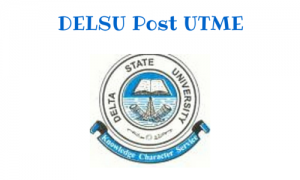 Below is the list of courses offered in Delta state University. Religious Studies English language, literature in English, IRS or CRS and any other 2 social science subject Literature in English, either Arabic or Islamic Religious Knowledge or Christian Religious Studies and any other social science subject. Library And Information Science English, maths, literature in English, and any other 2 social science subject Literature in English, government and any other social science subject. Linguistics English, maths, Literature in English, government and any other social science or arts subject. Government, literature in English and any other social science subject.